I adore wrap dresses. I find them very versatile and flattering. 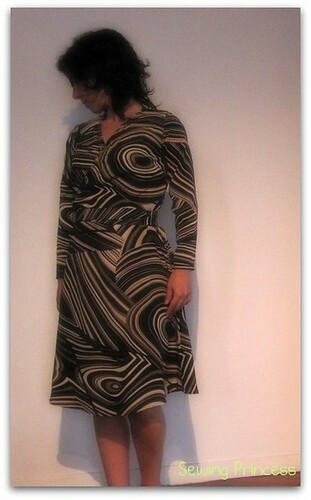 So a few weeks ago I embarked on a project to create my own pattern for a Diane Von Fustemberg-inspired wrap dress. In the end it took me longer that initially foreseen, so I think I will take it easy for my next project. As you may know the original wrap dress dates from the 70’s and was meant for jersey fabric and began as a cotton jersey shirt dress similar to a wrapped dancer’s sweater. From this initial concept, the shirt prototype was elongated into the frock commonly known as the wrap dress. But I wanted to use a 70’s style flairy fabric I bought last year at a fabulous Marché du Tissu – Stoffen Spektakel event (I absolutely reccomend this place and wish they had one event close to where I now live). The problem is that the fabric has no stretch whatsoever. So, I went on and modified my front basic bodice block to create a wrap style. You can achieve it rather simply by prolonging the waist line to the right (on the fold side) until you reach your half front waist. Then you raise a vertical line by 1 inch. Finally you connect that point with a diagonal line reaching the neckline. This allows you to create the diagonal line you need to make the dress wrap. There’s a bust dart on the front bodice and a waist dart at the back. Next thing is designing the ties… mine were 3 inches by 45 each. But you could also go for a button closure if you prefer. So, that’s all there is to the wrap dress in terms of patternmaking. In terms of finishing, you will notice that my neckline is sewn with elastic thread and you are probably wondering why… Well, I must admit it wasn’t planned. When I tried on the bodice I noticed something awful… the fabric is so drapey that it wouldn’t hold in place. After loads of pondering (and getting quite annoyed) I decided to sew three lines of elastic thread so that the fabric would stay in place. Have you ever made a wrap dress? I would love to hear your thoughts, tips, etc. I haven’t made one, but I’ve certainly been considering one so I’m sure I’ll be back to read all about the steps you made in drafting your own! I think they’re such classic pieces (and yours looks fabulous!) 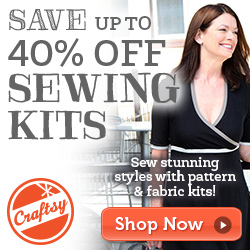 I just worry about the neckline gaping, so thanks for tips on how to fix that. here is an alternative to adding elastic instead of the elastic thread. i do something similar by serging the elastic along the inside of the raw edge which gently stretching, and then folding (which makes the elastic now inside and hidden by the seam allowance) and top stitched again — making sure to gently stretch the elastic again.